Just4Bass was working for Okeechobee Fishing Headquarters this morning. Today we had light winds and sunshine. It warmed the water up to 65 degrees and the fish were biting. 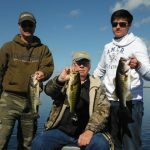 I was fishing with Kevin & Brendan Shannon and Frank Sanders. Here is a picture of some of the fish we caught today.